Other Ingredients:cellulose powder, croscarmellose sodium, stearic acid, silica, vegetable source magnesium stearate, ethylcellulose. Recommendations:Take 3 tablets daily, or as needed. May increase to 3 tablets, twice daily if desired. Each tablet serving contains 50 mg of caffeine, so a 3-tablet serving is 150 mg. That’s about the same amount in a cup and a half of brewed coffee, or about as much in three cups of black tea. 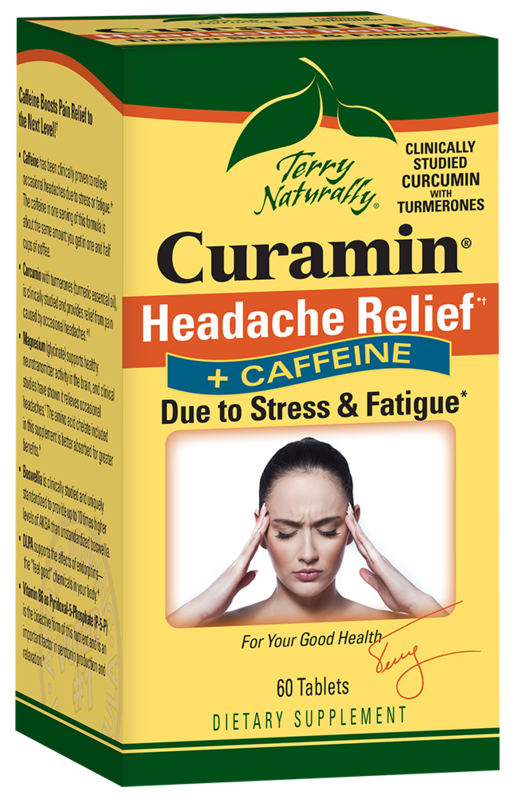 What is the difference between turmeric and the clinically studied curcumin in this formula? Great relief for stress headaches.+ Five Stars! This really helps! The caffeine kicks it up a notch in my book, but if you are sensitive to caffeine, get the other one without it. I buy both and take the one without caffeine at night if I need to. +Occasional headaches due to stress or fatigue.